^ Mark M. Boatner, Encyclopedia of the American Revolution, p. 769. ^ N.A.M. Rodger, "The Insatiable Earl", p. 96-97. ^ This account follows John Sugden, Nelson: A Dream of Glory, 1758-1797, ch. VII. Black, Jeremy. War for America: The Fight for Independence, 1775?1783. St. Martin's Press (New York) and Sutton Publishing (UK), 1991. ISBN 0-312-06713-5 (1991), ISBN 0-312-12346-9 (1994 paperback), ISBN 0-7509-2808-5 (2001 paperpack). Rodger, N. A. M. The Insatiable Earl: A Life of John Montagu, 4th Earl of Sandwich. W.W. Norton & Company (New York), 1993, ISBN 0-393-03587-5. Sugden, John. Nelson: A Dream of Glory, 1758?1797. New York: Holt; London: Jonathan Cape, 2004. ISBN 0-224-06097-X. Augur, Helen. The Secret War of Independence. New York: Duell, 1955. Chevalier, Louis E. Histoire de la marine francaise pendant la Guerre de l'Independence americaine. Paris, 1877. Dull, Jonathan R. The French Navy and American Independence: A Study of Arms and Diplomacy, 1774?1787. New Jersey: Princeton University Press, 1975. James, William Milbourne. 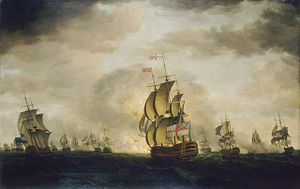 The British Navy in Adversity: A Study of the War of American Independence. London: Longmans, 1926. Knox, Dudley Wright. The Naval Genius of George Washington. Boston: Houghton Mifflin, 1932. Lewis, Charles Lee. Admiral de Grasse and American Independence. Annapolis: United States Naval Institute, 1945. Mahan, Alfred T. The Influence of Sea Power upon History. 1890. Mahan, Alfred T. The Major Operations of the Navies in the War of American Independence. Boston: Little, Brown, and company: 1913. Middlebrook, Louis F. History of Maritime Connecticut during the American Revolution, 1775-1783. 2 volumes. Salem, Mass. : Essex, 1925. Paullin, Charles Oscar. The Navy of the American Revolution: Its Administration, its Policy, and its Achievements. Cleveland: Burrows, 1906. Tuchman, Barbara. The First Salute: A View of the American Revolution. New York: Knopf, 1988. ISBN 0-394-55333-0. "West Indies Score Card during the American War for Independence", details the changes in possession of various islands during the war; includes maps.